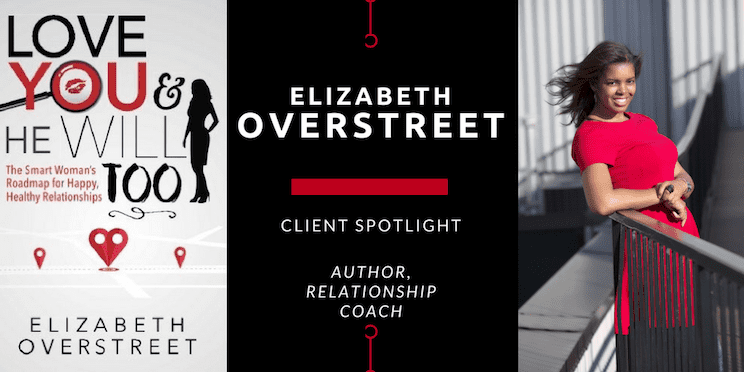 On today’s Client Spotlight, I am very proud to introduce you to Elizabeth Overstreet. Elizabeth is a relationship expert and the author of Love You and He Will Too: The Smart Woman’s Roadmap for Happy, Healthy Relationships. She’s a digital contributor to Jet Magazine and is a regular on radio and TV. I feel most of us expect relationships to run on auto-pilot, and when they don’t go smoothly, we have no idea how to fix them. Being a writer of character-driven stories, relationships are central to every plot I create. I took this opportunity to satisfy my curiosity about love, marriage, and meeting new people. I think everyone will find Elizabeth’s answers interesting. Read on! Tell us a little bit about your background and career. Christa, Great to be here doing this interview with you! I have always enjoyed understanding what makes a relationship tick. I come from a long line of family members who have been married for 50 years plus. I naturally observed many relationship dynamics growing up and I was intrigued with what made these relationships long-lasting. I’ve been married, divorced and dated as a single woman and a single parent and I have had my own learning experiences through my own relationships too. My background is in business, but in every career I’ve worked in what has intrigued me the most has been interpersonal relationships. I guess you could say I was destined to become a Relationship Coach. When did you have the idea to use your relationship know-how to help others? I have always been the person in my circle in which people would seek out for relationship advice. I believe the reason for this is that I could clearly see what people are missing which could make their relationship stronger. It’s like my sixth sense. I am also good at pairing up people who are compatible and helping them decipher what holds them back from relationship success. I contributed to a lot of marriages, long-term relationships and saved relationships too. What do you think is the number one contributor to relationship problems? It’s hard to narrow it down to one thing, but if I had to pick one, I would say it comes down to interpreting others based on who you may be as an individual. A lot of miscommunication and misunderstanding happens when you interpret what someone else does in a relationship based on how you would respond or act in a specific situation. This is when things can go AWOL quickly. It’s important to always ask someone why they are taking a certain action instead of assuming and then listen and figure out how to reach a happy median. Without good communication and understanding, even the best relationships can crumble quickly. Your new book is called Love You and He Will Too: A Smart Woman’s Roadmap for Happy, Healthy Relationships. What is the premise behind this book? I wrote this book because I want women to be happy with who they are and to not judge themselves so harshly. A lot of what you culminate in your relationships is what you have are based on how you feel about yourselves directly. I preach self-love a lot throughout the book, because as RuPaul says, ““If you don’t love yourself, how in the hell you gonna love somebody else.” And this premise is true. If you have a high-level of self-respect for yourself, it’s hard for you to be in an unhealthy relationship. So fundamentally, I believe the first step to finding love is in loving yourself. In this age, gender roles are in flux. How do you think this affects men in relationships? Women? Yes, gender roles are definitely impacting relationships. The great thing is that women can be anything career-wise and achieve so much success and be independent in a way that is different from previous generations. But, this creates issues in relationships because what makes you a successful businesswoman doesn’t translate to creating a successful relationship. Men want to feel needed. While being an alpha at work can get you ahead and help you to gain a great deal of success, in a relationship, you’re on a team. And this means you have to flex different skillsets to promote teamwork with your partner. When men feel you have it all covered, it can be hard to know where they fit with you. Knowing how to let a man take the lead, fix problems for you, and do things for you is important to relationship success. Using your feminine traits is critical to cultivating a strong relationship with a man. Like many, you’ve experienced divorce. Do you think marriage has value anymore? What do you think are the plusses and minuses of marriage today? Yes, marriage definitely has value. It is great to be with someone who has your back and is there to support you emotionally and physically. Marriage with the right person can offer those benefits for sure. Marriage can also help you do develop discipline in a relationship. These are the plusses in marriage. Marriage fails when you look to this person for your complete happiness, don’t balance the pressures you both experience in a marriage, expect your mate to stay the same and when you figure I’m married, the work is done. Relationships require continuous work and effort and sometimes more so when you are married. It’s easy and it’s going to naturally happen that people take each other for granted, but I think this happens a lot in marriage. I know a few couples who met online and are happily married. I’m curious to know what it’s like as a single woman in this world of dating apps. Is it scary? Do you recommend it to women who are looking for the right man? Yes, I recommend using Dating Apps. Dating apps are definitely part of the dating scene today. The upside is that it is a convenient and easier way to meet lots of men and narrow it down to those in which you have the most interest. The hard part is if you are getting back into the dating scene it can be overwhelming once you post to a dating site because you may feel bombarded. My advice is to find a couple of dating apps which you like, pay attention to some of the analytics around compatibility because sometimes they can be spot on and take it SLOW. Respond at your own pace and over time you will figure out which men are about the physical versus men who are looking for a relationship. It will be obvious in their communication with you, effort to get to know you and whether they are focused on your pictures or getting to know you. Of course, physical attraction for a man often occurs first, but the right man who is interested in you will work harder to attract the right woman. What do you think is the most important thing couples can do to keep their relationships healthy? Stay true to yourself. There is a reason that your partner was initially attracted to you. It’s natural to fall into a relationship and want to give everything to the other person almost in an obsessive way. But, couples who last for the long-haul do it differently. They have interests and commonalities with one another. But, they also have separate interests and activities they do on their own and with their friends. This creates balance and longevity in their relationship. I coach customers through developing healthy relationships, rebalancing an unhealthy relationship and increasing their self-esteem. I also do and have done TV and Radio interviews and write for several publications about relationships as well. Yes, I’m working on my next book and I think women will love it! If women have a specific topic in which they are interested in learning more, I’d also love to hear their feedback as I go through my creative writing process. What do you find most challenging about marketing your books and brand online? There is a whole process of marketing once you write a book, and Christa, you have been a Godsend in this way. I love writing, but marketing is definitely not my expertise. You have helped me to understand so much around branding, social media, and just getting out there which for most writers is probably the more difficult part! Since this isn’t my forte, my suggestion to other writers is to find a good marketing partner i.e. Christa! (LOL) This is her domain for sure! Note: Elizabeth Overstreet has helped me through a few meltdowns since I’ve worked with her. If you need someone to help you make sense out of yourself and those around you, make sure to contact her. Your first coaching session is FREE. Click here. Thanks so much to Elizabeth Overstreet for sharing some of her relationship wisdom with us. Please be sure to connect with her and buy her book using the links below. What you attract is a direct reflection of who you are and how you value yourself.